Georgetown College has changed for the better in a lot of ways, in the last few years. - We have a thriving diversity initiative. - For the past five years we have had written policies in place that prevent discrimination against gay students, and anti-harassment policies that protect people of all sorts. - Recently we hired our first openly gay faculty members. So we honestly believed it was a matter of mere housekeeping to extend the College’s nondiscrimination policies for faculty and staff to include such things as sexual orientation. In April 2012 the faculty approved such a policy for faculty. This proposal passed with 90% of the vote and a big round of applause. But last year the Board of Trustees voted down the new policy. We are here today to ask, in public, that the Board reconsider its decision, and to make the case for our proposal. This afternoon, over 100 Georgetown College students, faculty, staff, alumni, and allies came out to a powerful rally in support of a non-discrimination policy protecting members of their community who are lesbian, gay, bisexual, or trans-gender. At a college of just 1,200 students on a Friday just before finals, that's a pretty big deal. Throughout the semester, there has been a growing campaign to put pressure on the Georgetown College Board of Trustees since they declined to vote on the policy after the faculty overwhelmingly passed it last year. 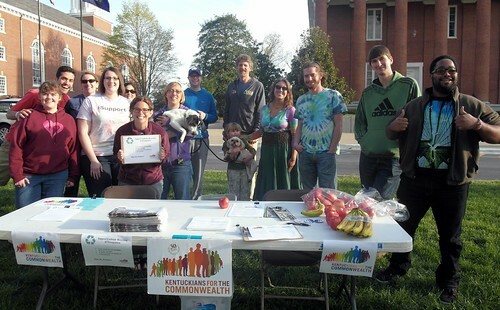 The work has been spearheaded by the Non-Discrimination Work Group on campus, but is supported by many organizations including Kentuckians For the Commonwealth members in Scott County. A number of media outlets came today generating stories like this piece from the Herald-Leader. 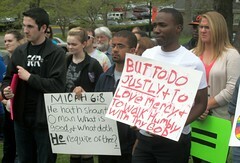 You can also find a gallery of other pictures of the rally online here. And although the semester is almost over, there's more work to do to pressure the Georgetown College Board of Trustees, including prior to their meeting tomorrow morning. Please join us at 8am at East Campus (at the edge of Georgetown College farthest away from downtown or main street - near the Georgetown College football field. ) to hold some signs at Board of Trustees members arrive for their monthly meeting. Some students are camping out in tents and sleeping bags there over night, but other supporters are invited to join them in the morning. Can you make it out in solidarity with them? Also, over 300 people have signed the petition in support of a non-discrimination policy. If you haven't already, please take two minutes to do it! 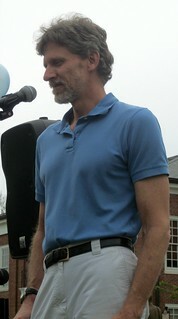 Yesterday was Earth Day at Georgetown College, sponsored by the Georgetown Sustainability Initiative. KFTC tabled, talking to people about Appalachian Transition, coal mining, and recycling, plus our work in solidarity with the campaign for a non-discrimination policy at Georgetown College. KFTC member Cristian Nunez also made a membership ask from the stage, and we managed to recruit 5 new KFTC members! You can find a few other pictures of the event here. This is one of an exciting series of events at Gerogetown College this week focused on non-discrimination work. Other events include a big rally on Friday and many, many other activities. 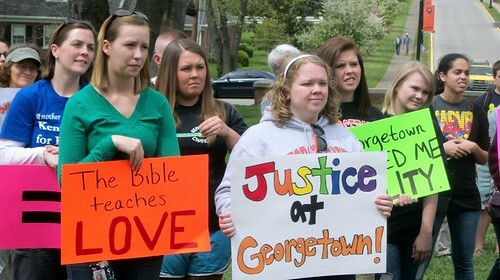 Additionally, we recently started an online petition here for a non-discrimination policy at Georgetown College. Please sign it and pass it along to others.